Just take a look at some of the big movers in the under-$10 complex from Thursday, including Zalicus (ZLCS, which is ripping higher by 29%; Onconova Therapeutics (ONTX, which is soaring higher by 22%; and Arotech (ARTX, which is trending higher by 17%. You don't even have to catch the entire move in lower-priced stocks such as these to make outsized returns when trading. One low-priced stock that's exploding higher today is biotechnology player Geron (GERN - Get Report), which I highlighted in May 22's "5 Stocks Under $10 Set to Soar" at around $2 a share. I mentioned in that piece that shares of Geron were trending sideways and consolidating for the last two months, with the stock moving between $1.69 on the downside and $2.53 on the upside. This stock was just starting to spike higher off its 50-day moving average and move within range of triggering a major breakout trade above the upper end of its recent sideways trading chart pattern. Guess what happened? Shares of Geron started to trigger that breakout on Wednesday after the stock ripped sharply higher and closed above $2.53 a share with heavy upside volume. Volume on Wednesday registered 13.5 million shares, which is well above its three month average action of 5.32 million shares. Shares of GERN are exploding higher again today with the stock trading up close to 30% at around $3.30 a share. That represents a monster gain of 70% from the time I first flagged this stock near $2 a share. One under-$10 specialty chemicals player that's starting to move within range of triggering a major breakout trade is Synthesis Energy Systems (SYMX, which provides various proprietary gasification technology systems and solutions to the energy and chemical industries worldwide. This stock is off to a red hot start so far in 2014, with shares up a whopping 191%. If you glance at the chart for Synthesis Energy Systems, you'll see that this stock has been uptrending over the last month and change, with shares moving higher from its low of $1.39 to its recent high of $1.85 a share. During that uptrend, shares of SYMX have been making mostly higher lows and higher highs, which is bullish technical price action. That move has started to push shares of SYMX within range of triggering a major breakout trade above some key near-term overhead resistance levels. Traders should now look for long-biased trades in SYMX if it manages to break out above some near-term overhead resistance levels at $1.85 to $1.86 a share and then once it takes out more key overhead resistance levels at $1.93 to $2 and $2.09 a share with high volume. Look for a sustained move or close above those levels with volume that hits near or above its three-month average action of 594,782 shares. If that breakout gets underway soon, then SYMX will set up to re-test or possibly take out its next major overhead resistance levels at $2.44 to its 52-week high at $2.49 a share. 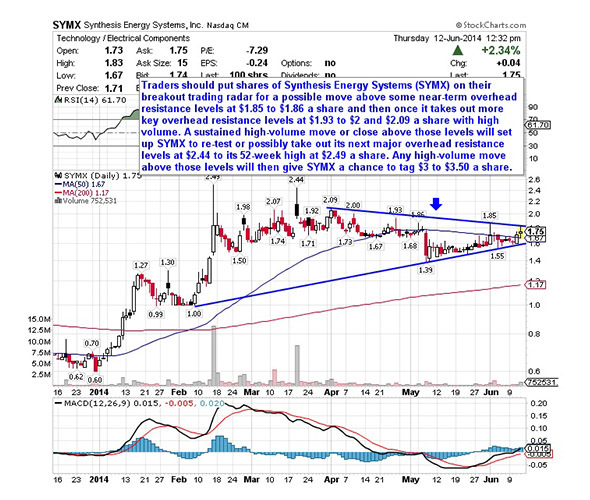 Any high-volume move above those levels will then give SYMX a chance to tag $3 to $3.50 a share. Traders can look to buy SYMX off weakness to anticipate that breakout and simply use a stop that sits right below some key near-term support levels at $1.60 to $1.55 a share. One can also buy SYMX off strength once it starts to clear those breakout levels with volume and then simply use a stop that sits a comfortable percentage from your entry point. An under-$10 biopharmaceutical player that's starting to trend within range of triggering a big breakout trade is Endocyte (ECYT, which develops targeted therapies for the treatment of cancer and inflammatory diseases in the U.S. This stock is off to a nasty start in 2014, with shares down sharply by 35%. If you take a look at the chart for Endocyte, you'll see that this stock has been trending sideways and consolidating for the last month and change, with shares moving between $6.01 on the downside and right around $7.30 on the upside. This consolidation pattern is coming after shares of ECYT gapped down sharply in May from over $17.50 to $6.50 a share with heavy downside volume. Shares of ECYT are now starting to trend higher off its recent low of $6.05 and it's quickly moving within range of triggering a major breakout trade above the upper-end of its recent sideways trading chart pattern. Market players should now look for long-biased trades in ECYT if it manages to break out above some near-term overhead resistance at $7.30 a share with high volume. Look for a sustained move or close above that level with volume that registers near or above its three-month average action of 1.90 million shares. If that breakout materializes soon, then ECYT will set up to re-fill some of its previous gap-down-day zone from early May that started at just above $17.50 a share. Some possible upside targets if ECYT gets into that gap with volume are $9 to $10 a share, or even its 50-day moving average of $12.10 a share. Traders can look to buy ECYT off weakness to anticipate that breakout and simply use a stop that sits right below its recent 52-week low of $6.01 a share. 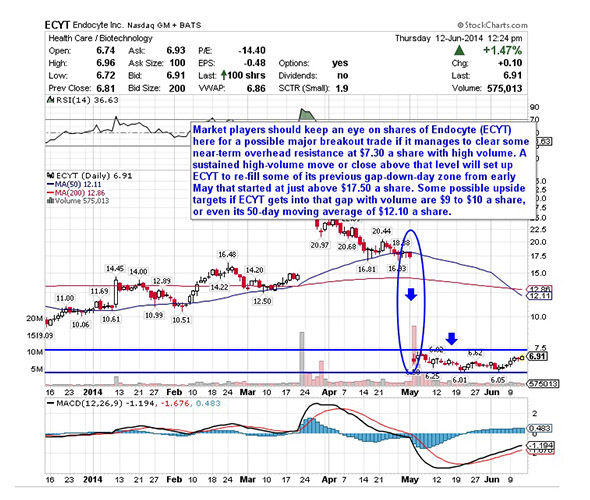 One can also buy ECYT off strength once it starts to take out $7.30 a share with volume and then simply use a stop that sits a comfortable percentage from your entry point. Another stock that's starting to move within range of triggering a big breakout trade is BG Medicine (BGMD), which develops and commercializes novel cardiovascular diagnostic tests to address unmet medical needs in the U.S. This stock has been pushed lower by the sellers over the last three months, with shares down sharply by 20%. If you take a glance at the chart for BG Medicine, you'll notice that this stock has been uptrending a bit for the last month, with shares moving higher from its low of 90 cents per share to its recent high of $1.12 a share. During that uptrend, shares of BGMD have been making mostly higher lows and higher highs, which is bullish technical price action. That move has now pushed shares of BGMD within range of triggering a big breakout trade above some key near-term overhead resistance levels. Traders should now look for long-biased trades in BGMD if it manages to break out above some near-term overhead resistance levels at $1.08 to $1.12 a share with high volume. Look for a sustained move or close above those levels with volume that hits near or above its three-month average action of 1.56 million shares. 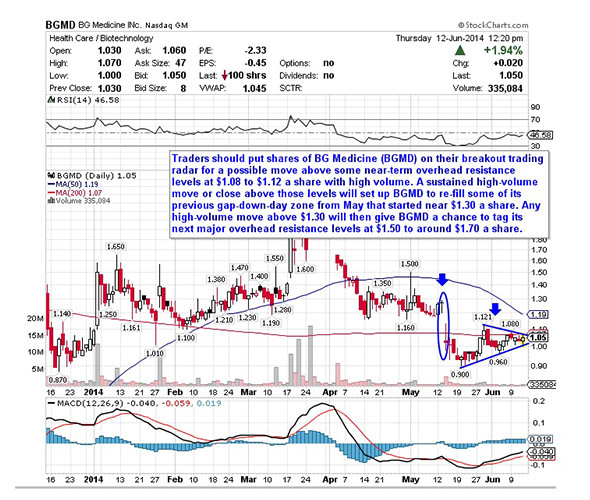 If that breakout gets started soon, then BGMD will set up to re-fill some of its previous gap-down-day zone from May that started near $1.30 a share. Any high-volume move above $1.30 will then give BGMD a chance to tag its next major overhead resistance levels at $1.50 to around $1.70 a share. Traders can look to buy BGMD off weakness to anticipate that breakout and simply use a stop that sits right below some key near-term support levels at 96 cents to 90 cents per share. One can also buy BGMD off strength once it starts to clear those breakout levels with volume and then simply use a stop that sits a comfortable percentage from your entry point. Another under-$10 biotechnology player that's starting to trend within range of triggering a near-term breakout trade is Exelixis (EXEL - Get Report), which develops small molecule therapies for the treatment of cancer in the U.S. This stock has been crushed by the bears so far in 2014, with shares down sharply by 41%. If you look at the chart for Exelixis, you'll notice that EXEL has been trending sideways and consolidating for the last two months and change, with shares moving between $3.02 on the downside and $3.84 on the upside. 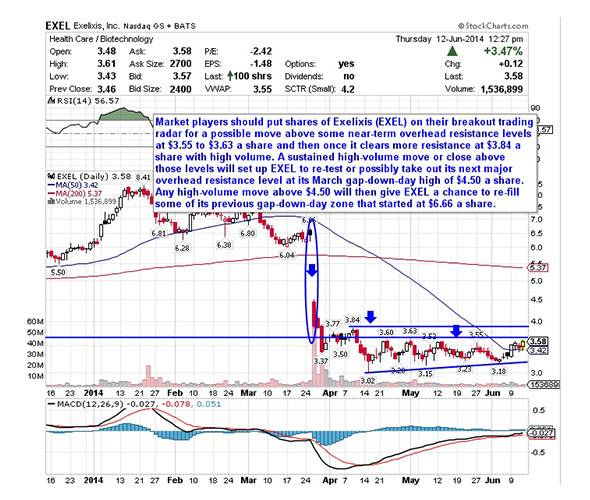 Shares of EXEL are starting to spike higher today right off its 50-day moving average of $3.42 a share. That spike is quickly pushing shares of EXEL within range of triggering a near-term breakout trade above some key overhead resistance levels. Market players should now look for long-biased trades in EXEL if it manages to break out above some near-term overhead resistance levels at $3.55 to $3.63 a share and then once it clears more resistance at $3.84 a share with high volume. Look for a sustained move or close above those levels with volume that hits near or above its three-month average action of 4.85 million shares. If that breakout kicks off soon, then EXEL will set up to re-test or possibly take out its next major overhead resistance level at its March gap-down-day high of $4.50 a share. Any high-volume move above $4.50 will then give EXEL a chance to re-fill some of its previous gap-down-day zone that started at $6.66 a share. Traders can look to buy EXEL off weakness to anticipate that breakout and simply use a stop that sits right below some key near-term support levels at $3.18 to $3.02 a share. One can also buy EXEL off strength once it starts to move above those breakout levels with volume and then simply use a stop that sits a comfortable percentage from your entry point. One final under-$10 biopharmaceuticals player that looks ready to trigger a near-term breakout trade is Northwest Biotherapeitics (NWBO, which discovers and develops immunotherapy products to treat cancers in the U.S. and internationally. This stock has been off to a monster start so far in 2014, with shares up sharply by 78%. If you take a glance at the chart for Northwest Biotherapeutics, you'll notice that this stock has been uptrending for the last month, with shares moving higher from its low of $4.87 to its recent high of $6.80 a share. During that uptrend, shares of NWBO have been making mostly higher lows and higher highs, which is bullish technical price action. That uptrend started right off NWBO's 200-day moving average and the stock has now started to spike higher today right off its 50-day moving average. This move is starting to push shares of NWBO within range of triggering a near-term breakout trade above some key overhead resistance levels. Traders should now look for long-biased trades in NWBO if it manages to break out above some near-term overhead resistance levels at $6.72 to $6.80 a share with high volume. Look for a sustained move or close above those levels with volume that hits near or above its three-month average action of 991,491 shares. If that breakout triggers soon, then NWBO will set up re-test or possibly take out its next major overhead resistance levels at $8 to $9 a share. 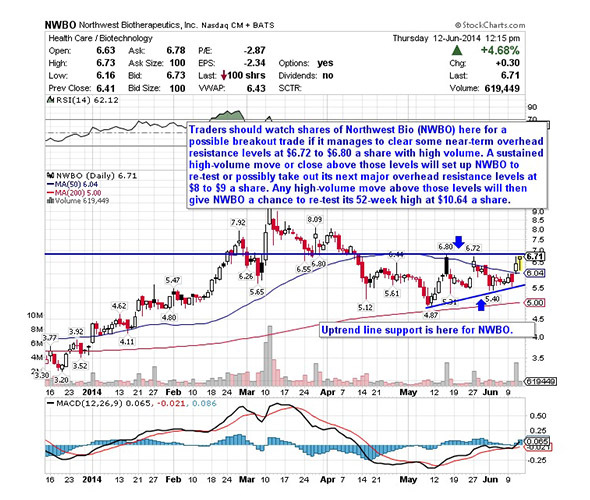 Any high-volume move above those levels will then give NWBO a chance to re-test its 52-week high at $10.64 a share. Traders can look to buy NWBO off weakness to anticipate that breakout and simply use a stop that sits right below its 50-day moving average of $6.04 a share or around more support at $5.50 a share. One can also buy NWBO off strength once it starts to trade above those breakout levels with volume and then simply use a stop that sits a comfortable percentage from your entry point.